Our inline sliding patio doors feature a slimline profile designed to fit more naturally into a room, and to minimize the amount of plaster disruption which takes place when installing. 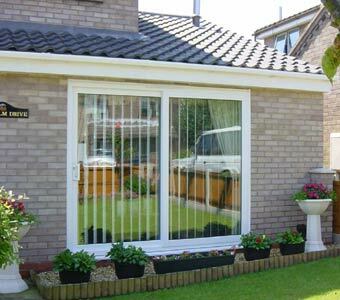 We’ve combined an outer frame made of thermally efficient UPVC with 28mm thick double glazing to provide truly exceptional security and property insulation. A six point locking system with one piece stainless steel locking keeps and ‘anti-jacking’ feature will further ensure that our customers can rest easy in the knowledge that their patio doors offer the highest security standards.Create a dramatic impact on your property with the wide, uninterrupted glass area of a our sliding patio doors. In addition the outer frame and opener are steel reinforced and an anti-slam and lift device is fitted as standard. Our UPVC patio doors provide exceptional levels of insulation, helping you to ensure that your property is energy efficient. 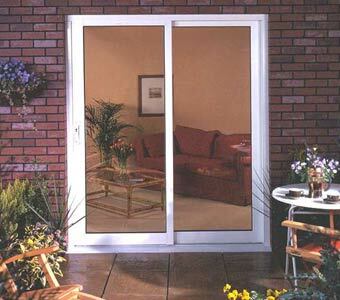 As kind to your wallet as they are to the environment, our sliding patio doors feature built in seals to keep the heat in and draughts out of your property. Meanwhile, the double glazing and interior sliding panels, which come as standard on all our patio doors, help keep you warm in winter and cool during the summertime. The locking mechanisms full length keep is screwed into a galvanized steel reinforcement.